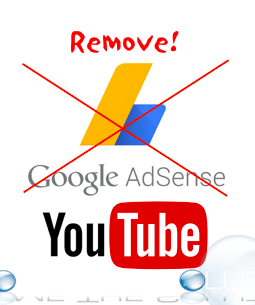 If you are trying to remove your Google AdSense account association completely from a YouTube account, you have only the option below, which is confirmed by Google support at this time. Google (now owner of YouTube) confirmed that the option to disable monetization from the channel level (as a whole) was remove at some point making the removal process a little more time consuming. Go to YouTube Video Manager. Check off the box next to "Actions" button to select all videos. Do this for all the videos in your channel Monetization is enabled. 1. Sign in to your YouTube channel and go to www.youtube.com/account_monetization. 2. Click Review or change AdSense association. You'll see details about the AdSense account you currently have linked. 4. Copy the page's URL. 5. Sign out of your account and close your browser. 6. Open a new browser and go to accounts.google.com/logout. This will sign you out immediately. 7. Click Remove an account at the bottom of the page. Click the X next to all the accounts listed on the "Remove an account" page, then click Done. 8. Open a new tab in your browser and paste the AdSense sign-up URL you previously copied. 9. Click Sign in and sign in to the email associated with your AdSense account. You'll be redirected back to YouTube. 10. Click Next (this will bring you to the correct YouTube channel). 11. When prompted to sign in, select Sign in with a different account. 12. Sign in with the email associated with your YouTube channel. You'll be redirected to your YouTube channel. Note: Once per Google support, you cannot completely remove the associated AdSense account entirely. You can only change the association. This needs to change! Nice info...I have a question,if you delete google or youtube account will cancel your adsense account...Cuz im having trouble linking my channel to adsense because of "already existing Adsense account"...This is driving me nuts to solve,do you know how to fix it?